Singularly spectacular! Hard work truly pays off. The heliac arc is exquisite and the Tape arc brightenings quite convincing. This Riikonen arc strikes me as a form that will be documented in daylight as well when the conditions are right. That arc rises from 3-5-1 type ray path in Parry oriented columns. It is one of those faint strange arcs you can get when you make simulations with Parry orientation. You can see this arc for example in the Atmospheric Halos by Tape (1994) on page 117 in simulation for solar elevation 0 degree. Do I need to mention that this ray path 3-5-1 is unique and there is no other halos from Parry orientation associated with that ray path. So this is a genuine halo which has not been documented earlier. As Jari pointed out, this arc can be seen in solar displays as well, but the sun must be at very low elevation (about 6 degree or less). Thanks Jarmo for the specs. So, the raypath is the same as for the Kern arc (the one given by Tape in Atmospheric Halos), except that the direction is opposite. The resemblance is, indeed, quite remarkable. Well. Direction of ray path is different and crystal orientation is different. So this arc and Kern arc does not have too much common. The fact that ray goes in from horizontal crystal face and exit from vertical crystal face having one internal reflection gives these halos very similar looks. Different angles between involved faces makes these arcs looks a little bit different. More precisely, the raypath for this arc is the same as for a "circumhorizon arc Kern", as yet a completely theoretical halo. Quess the genuine Kern arc equivivalent raypath will also make a halo in these Parry crystals, possibly it shows up at higher lamp elevations. Kern arc forms the better the more towards triangle the crystals are. Same is with this Ounasvaara arc. Triangle bound habit seem to be a rule in these snow gun displays. They may also be more prone to take Parry orientations. The genuine Kern arc itself is of course a full possibility in the halogen beam. There need to be only a good contribution of plates and the lamp must be elevated with respect to observer. So 3-5-1 in Parry oriented crystals... Marko, it is so exciting. Congratulations on this catch! This new lamp and your hard work opens up new areas for discovery in studying halos. I think tecnically this halo could be called a displaced circumzenith arc or something like that. The inner reflection relocates the circumzenith arc. So it is a colored halo. The Kern arc is also a displaced circumzenith arc. Difference between this arc and circumzenith arc (from Parry oriented columns) are greater than difference between tangent arcs and Wegener arc or between Parry arc and Hasting arc. Hastings arcs are only rotated Parry arcs. This arc is more than just a rotated circumzenith arc. It also could be call as displaced Hasting arc (3-5-1 new vs. 3-1-5 Hastings). 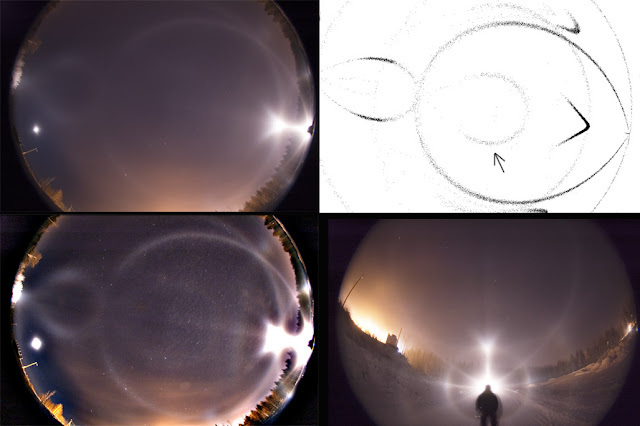 This arc is in matter of fact more unique halo than many other rare halos. Hastings arcs are Parry oriented analogue for subparhelia. Ray path of this arc seems not have any analogues among any frequently observed halos produced by other orientations. I was thinking that Jarmo is going wrong with his displaced Hastings, but indeed, that's how it seems to be. Spectacular insight! So the term 'rotated' here has a different meaning than 'displaced' then? Wow Marko congrads in dicovering a new halo form!!! This is just amazing what you are seeing from divergent light sources. One thing I have been wanting to tell you I think would be cool is to take a hi-power light and mount it on a pulley system on a very tall pole and have wireless remote and with the touch of a button move the light up or down and watch the halos change their shape with elevation. This will allow one to make halos into an art so long there are diamond dust choking the sky. Again congrads on you photos Marko. Good idea Michael. Such a system should be quite sophisticated, because it is not only enough to move the light up and down, but the beam should also point to a same spot on the ground all the time. If you are not exactly in the middle of the beam, the display will suffer markedly. Another thing is that we can't control where the diamond dust decides to go. Many displays are bound to be missed with a stationary pole. About the ray path of Riikonen's arc. Walter Tape noted me that the correct ray path is 4-8-1. I checked this and Walt is right. The correct ray path is 4-8-1. There seems to be a bug in side face numbering with Parry orientation in the code of simulation program I use for ray tracing. Strange that I have not noticed that earlier. Sorry about wrong ray path information. Well, Jarmo, that's was not a big mistake. So, what this makes then? 4-1 is upper Tape arc and 4-8-1 makes it a rotated Tape arc (in addition to displaced Hastings)?